I apologize to all our of readers if this might be coming off as a rant about ideologies, and it’s not, just the opinion of someone who still dreams big, but politics and reality keep getting in the way and won’t stop being annoying! Breathe…In through your nose, out through your mouth…3 seconds in, 3 seconds out. But you know what was? 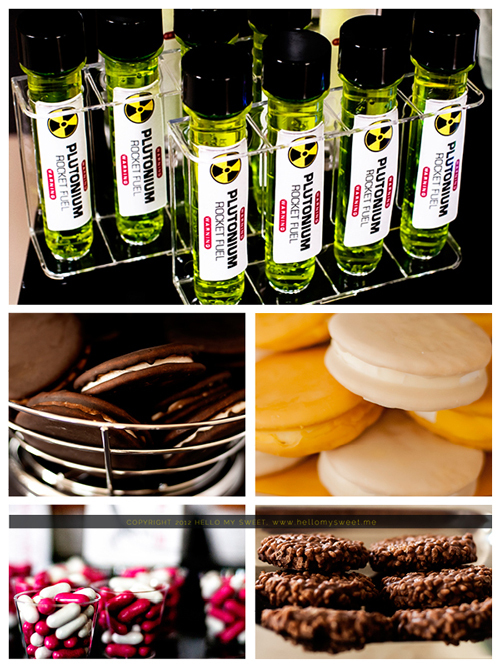 Hello My Sweet’s spectacularly Retro Rockets & Rayguns themed dessert table, that’s what! I have to admit, I was really super excited about designing this table, so much in fact that I started to build props of rocket packs and intergalactic rocket ships before I had even finalized the design of the table. It’s like the inner kid in me came out and didn’t want to go back to adult land and actually start to shape this table into a cohesive look. So after watching the 1980 Dino De Laurentiis rendition of Flash Gordon and another cult classic, 1956’s Forbidden Planet, I had plenty of ideas just swirling around my noggin. I decided upon a more retro look akin to When Worlds Collide, after a disastrous accident with the first version of my rocket ship prop/centerpiece. As I said earlier I had finished it so early that it was just perched precariously atop our refrigerator and met with untimely death on our kitchen floor. After ditching the Flash Gordon-esque look, I eventually went with more of a traditional rocket look. Two other props that I had done for our table, a space helmet and a rocket pack, are actually wearable items that kids can use to “fly” around the room and burn off a little of that energy! We will be posting a D.I.Y. in the coming weeks on how we made these items, but suffice it to say you can work some crafting magic with just 1 liter soda bottles, paper cups, a package of elastic banding, an Utz cheese ball container, hot glue and some spray paint. On one of our countless trips to Lowe’s we also stumbled upon a K-Cup container/carousel thingy (I apologize I don’t know what else to call it) that I knew I just had to have for THIS table. It looked straight outta the 1960’s, with its “futuristic” design and chrome finish. From Dollar Tree’s candle holder section, three fishbowl shaped candle holders and three cylindrical shaped votive holders. 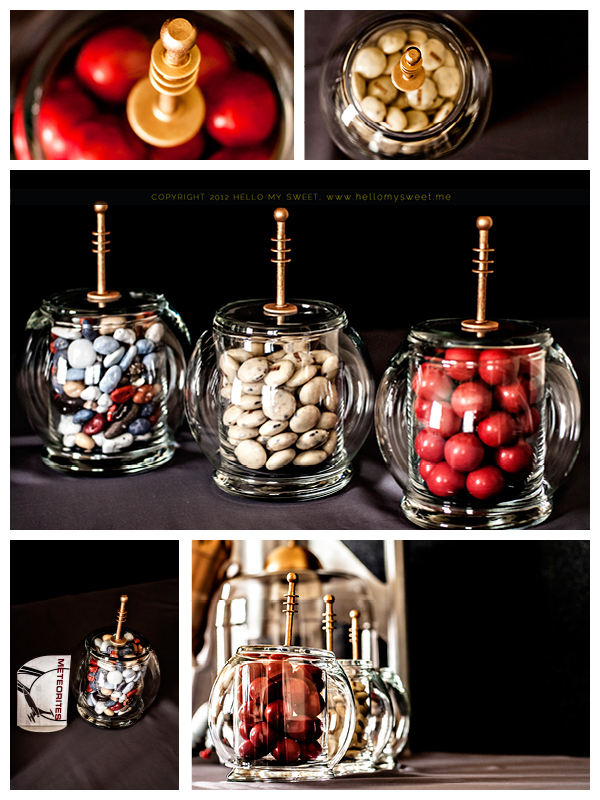 When you combine these two different shaped candle holders together, just by putting the fishbowl shaped ones over top of the cylindrical holders, you now have a candy/snack container shaped like a space helmet! The fishbowl shaped holder just lifts off (no pun intended!) to expose the goodies inside the other candle holder. Not to toot my own horn, but…INGENIOUS! I even added a few details to the top of the spherical candle holders to tie in the look of them with the large space helmet made out of the Utz cheese ball container. Several other purchases that also came from Dollar Tree; 2 packages of water guns that were spitting images of the old fashioned “Ray Guns.” I just used some fine grit sanding paper to scuff up the surface, masked off a few areas and painted them to match the other props on the table. Lastly we ended up purchasing 2 packs of inexpensive paper plates, one pack of white, and another of black. I then cut a crescent shape out of the white plate and used double sided tape to adhere it to the whole, uncut, black plate. A small and easy D.I.Y. that adds extra atmosphere (“atmosphere”…see what I did there?) to the whole setup! Another idea I wanted to implement was for the beverages on our table. Specifically I knew I wanted it to be a two-step interactive process that kids (of all ages) would enjoy. Anytime you can get your party guests involved in the party they are at, instead of just being in attendance, you are winning. And although the combination process doesn’t actually involve any actual science, it’s just Mio Liquid Water Enhancer and club soda, you could integrate that into your own party setup. One container would have the “fuel”, or a small amount of Mio flavored club soda, and would be added to another container, the “tank”, that would house the clear club soda. We had on hand from previous holidays, some Wilton containers of sugar sprinkles that oddly looked like test tubes. I just dumped out the sprinkles into some Tupperware, and cleaned them out. After looking at the empty test tubes, and by “looking” I really mean staring. And by “staring” I really meant to say zoning out. Then it hit me! These things look like the “fuel cores” used in another favorite sci-fi movie, The Fifth Element. I know it’s not really in the realm of “retro” but hey it works for this idea…just go with it. Then all I needed was my “fuel tank,” and remembered a bottled water brand by the name of VOSS that had some really nifty looking bottles. There was just one teensy problem. I could not find these damn bottles at any of our local grocery or convenience stores. That is, until I took a trip to my mother’s house in northern Virginia and my son and I had to stop at a Sheetz to gas up. While there we decided, and by “we decided” I mean my son needed yet another snack, to go inside and there they sat. It’s like the final piece of the puzzle had clicked into place, I now had my fuel tanks. I purchased 8 of them right on the spot, rather difficult considering I had 8 bottles of water in my hand, along with my son’s food, and let us not forget the toddler that does NOT want to stay by my side during the check out process. Sigh…I’m fairly certain I got some odd looks, but totally worth it. Just check out our snazzy animated GIF and we’ll let you decide if it’s totally cool or not. Having an Etsy store ourselves, we are always appreciative of the purchases of our customers, so we try to “pay it back” to the community by purchasing from other Etsy stores. We came across this store that was offering a “three compartment stainless steel tray” that bore more than a passing resemblance to the Martian eye-probe from the 1953 War of the Worlds sci-fi movie. After realizing this, I just had to have it as well. On all these really cool plates, trays and containers sat our goodies. They ranged from bite-sized treats consisting of “Lunar Bits” or Hershey’s Cookies’n’Crème drops, “Meteorites” or Milk Chocolate Rocks from Wal-Mart, “The Original Atomic Fireballs” or really effing hot balls of fire in your mouth, to “Food Pills” or Good & Plenty’s. Because you know, in the future all your food will come in pill form… We also had some larger desserts such as “Moon Pies”, Vanilla and Banana flavored, “Star Crunch”, “Black Hole” or chocolate donut gems, “Dark Matter Pops” or Devils Food Jell-O pudding pops, and Milky Way cupcakes. 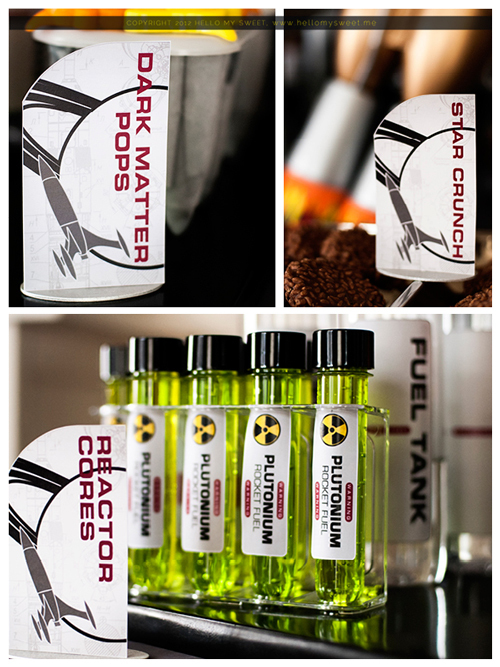 Party guests washed it all down with “Reactor Cores” and “Rocket Fuel” or Mio Flavored club soda. As far as the printables go, I just want to state that you can derive inspiration from the strangest of places or things. At some point in time someone had gotten me some article of clothing from UNIONBAY. It came with a tag, that with a little tweaking, I thought would look great on our table. Modify the overall shape slightly and keep the orientation, change the colors, throw in some retro sci-fi elements and voilà. Hopefully an instant classic with customers over at our Etsy store. 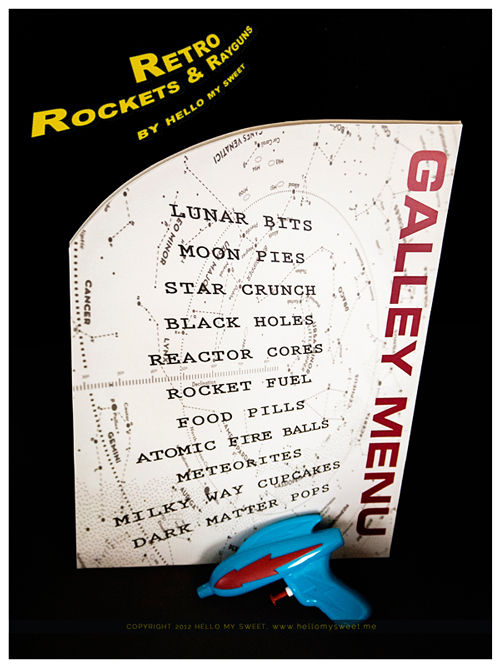 The large menu, something we at Hello My Sweet started to do with our Rainbows and Candyland party, uses a bold retro stellar cartography map as it’s backdrop and lists the food items in such a way that the names appear to be blasting off into the void of space! I wanted to have a bit of fun with the invitation and model it after a mash-up of an old timey telegram message, with the “stops” or breaks, and receipt of orders from HQ. The “Thank You” card included in our set is also a break from the norm in that it replicates receiving an award or plaque for your attendance. Again it is our hope that everyone who sees this table will get some great ideas and inspiration, and of course dares to dream big regardless if they are 8 or 80. We were very satisfied with the end results of the table, the décor, and of course the printables, but if anyone out there has any suggestions, praises or critiques please feel free to leave a comment in our comment section!